Whereas not that long ago a bike manufacturer’s premiere race bike was a single design, these days there exists three segments of race-able hardware from most leading brands: the lightweight model, the endurance model, and the aero model, all of which can be and are raced at the Pro Tour level. For Specialized, the Three Musketeers are the Tarmac, the Robaix, and the Venge, respectively. When the Venge debuted in 2011, it boasted a combination of aerodynamic efficiency and light weight not found in any previous aero bike. The second generation, reviewed here, was further refined and also added disc brakes to bring the design up to modern standards. As much as purists decry the use of disc brakes on road bikes, the march of progress is undeniable, and disc brakes are here to stay. Even the UCI finally agrees. As a more budget-oriented model, the Venge Expert Disc model we rode eschewed Specialized integrated cockpit in favour of a Pro SL alloy stem and carbon S-Works Aerofly handlebar. You have to deal with unsightly cables and their associated aerodynamic drag, but you save quite a bit of coin in the process. Built with a full Ultegra 8000 group and Roval SLX 24 Disc wheelset with DT Swiss hubs, this is a no-nonsense build that takes advantage of Shimano’s engineering might to provide a smooth and seamless riding experience. Specialized’s own engineering prowess is on display on any part not labelled Shimano or DT, utilizing their own saddle, seatpost, stem, bar, and tires for the rest of the build. It may not be exotic, but it just plain works, and works well. The only fault I could find with the overall build was the Roval wheelset. The wheels are fine – durable, lightweight, reasonably stiff – but a beautiful aero bike design like this cries out for some deeper section aero rims to match the slippery frame. The good news is that because this bike uses disc brakes and a through-axle design with the most common current hub standards (12x100mm front, 12x142mm rear), when (not if) you upgrade the wheelset to some deeper carbon hoops, chances are they will also fit your next bike down the road. Not guarantees, but this is as future-proof as you can get these days. So what is it like to ride? As you can imagine, it’s fast and stiff. But what it also is, surprisingly, is compliant and stable. Aero road bikes, with their large tube cross-sections and racing intent, have been known to be uncomfortable over rough roads, and twitchy handling. Not so the Venge. 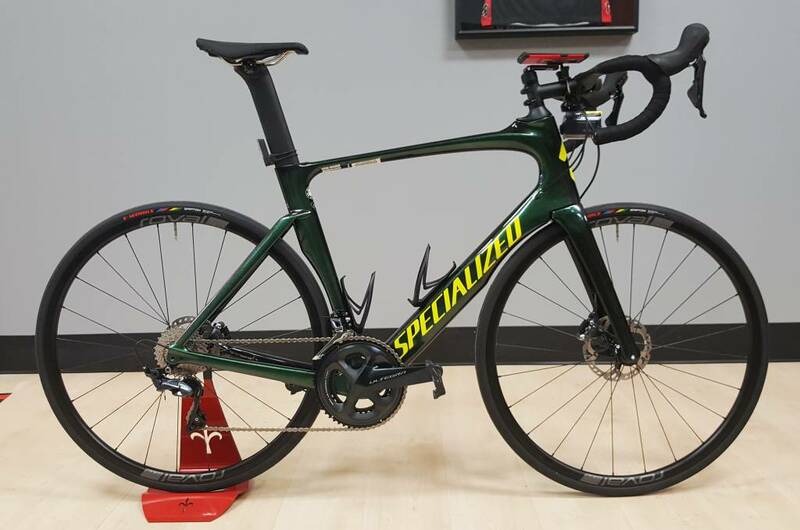 Specialized has used their years of experience in shaping carbon fibre to produce a frame that is stiff where it needs to be (head tube, bottom bracket), and compliant where it doesn’t (seat tube, seat stays), such that the ride is quite good. The geometry is racy but not unstable, a great combination for those that don’t need lightning-quick handling while rubbing elbows down the Champs-Élysées on the bell lap. It is precise, but not darty like the last Trek Émonda I sampled. For most recreational riders I will recommend the endurance road bike, with its comfort enhancing technology, more upright position and more stable geometry, as the tradeoffs in weight and aerodynamics do not make a significant enough difference unless you are racing for every last second. However, these days bike designers have begun to be able to combine the better traits of each bike in a sort of cross-breeding of traits, allowing a bike like the Venge to have more compliance and stable handling like an endurance bike, but retaining the slippery aero qualities of the breed. In the past I would have labelled the Venge a “for racers only” purchase, but after spending quite a bit of time on this one, that is certainly not the case now.